Hampton Roads Chapter of the Rocks, Inc. - HOME - The National Board of the ROCKS, Inc. THE HAMPTON ROADS CHAPTER, ROCKS, INC. The HRC Vision: To become the premier ROCKS, Inc. chapter in the world, focused on the “full spectrum development" of military officers and senior civilians. The HRC Mission: To strengthen the officer, cadet and senior civilian corps of the military in the Hampton Roads Area by promoting and providing mentorship, leadership, scholarship, fellowship, counseling, good citizenship, community service, and professional networking. a) Keep current members informed on what the chapter is doing and how they can get involved. Such documents may include letters, Calendar of Events, Membership Roster, Leader Professional Development (LPD) Schedule for the Year with Topics and Presenters, Treasurer's Report, and Chapter By-laws. b) Reach out to new members, inform them on HRC activities and encourage them to attend chapter meetings, get active and get involved. At the appropriate time, provide them a copy of the Membership Application. c) Develop a strategy to determine how to best reach "all" junior officers, cadets, and applicable civilians. a) Advertise HRC ROCKS, Inc. meetings and activities in installation and local newspapers, and the Rocket. b) Publish HRC ROCKS, Inc. brochure. c) Develop HRC ROCKS, Inc. business cards for members to use as recruiting tool. d) Maintain and Update chapter and National websites with most current information. e) Continue to update Chapter Facebook site and post archives material to Shutterfly site and other designated storage locations. f) Leverage the use of all social media (i.e., Twitter, Instagram, etc.) to inform current members and to recruit new members. a) Invite BN and BDE level CDRs from surrounding installations to lead open discussions at General Membership Meetings. b) Sponsor activities to allow for members to network. Ø Objective 4: Conduct appropriate venues to award scholarships and recognize members. Ø Objective 5: Conduct Outstanding Student Awards presentations as part of Leadership and Community Outreach. GOAL 2: Explore new approaches and techniques for identifying, attracting, and mentoring junior officers. Target is to mentor at least 5 junior officers whether they are a member or not. Monitor, and where appropriate, implement the National Board Mentorship Program. Ø Conduct career and professional development training, (forums, symposiums, and seminars) to promote the personal and professional growth of our junior officers in the Hampton Roads area. Establish collaborative boards / collaborative capability. GOAL 3: Conduct fundraising to sustain chapter operations, with an emphasis on scholarships. GOAL 4: Conduct one community event semi-annually. 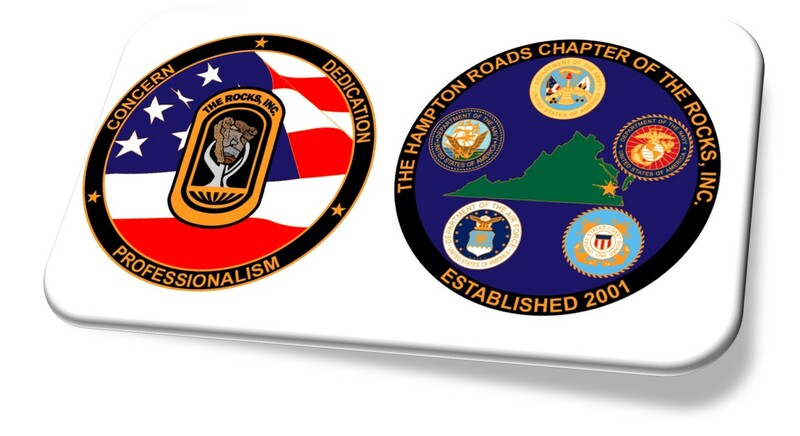 The Hampton Roads (HR) Chapter of The ROCKS, Inc. began during the summer of 2000 when a few interested officers got together to discuss the need for and benefits from starting a ROCKS Chapter in the Hampton Roads Virginia area. From September to November 2000, coordination and planning were conducted to establish an Interest Group and organize a formal structure to obtain Chapter status. In November 2000, the National Headquarters of The ROCKS, Inc. approved the establishment of the Hampton Roads Interest Group of ROCKS, Inc. The Interest Group began to implement a community service program and a cadet mentoring program. In November 2001, the National Board of The ROCKS, Inc. gave approval to the Hampton Roads Interest Group to be chartered as the Hampton Roads Chapter of The ROCKS, Inc. The chartering ceremony was held on November 30, 2001 at the Hampton University Museum, Hampton University. The HR Chapter of The Rocks, Inc. continues to provide service to the community, mentorship for junior officers and cadets, transition mentorship from military to civilian life, and a networking forum for its members. Membership has increased significantly since 2001 and we look forward to a bigger and brighter future.